How often have you heard grandparents and parents say, when talking about the children they love, the most important thing to them is for their grandchild or child to be happy? Our world chases after happiness. We think more, bigger, better, newer, cooler will all equate to happiness. But it does not. Oh, yes, people may be “happy” for a few moments, until what they have is no longer more, bigger, better, newer or cooler. Happiness depends on situations, and as we know, situations change – all too fast. What people are really looking for is joy; and it is not found in things. So, where do we find joy? 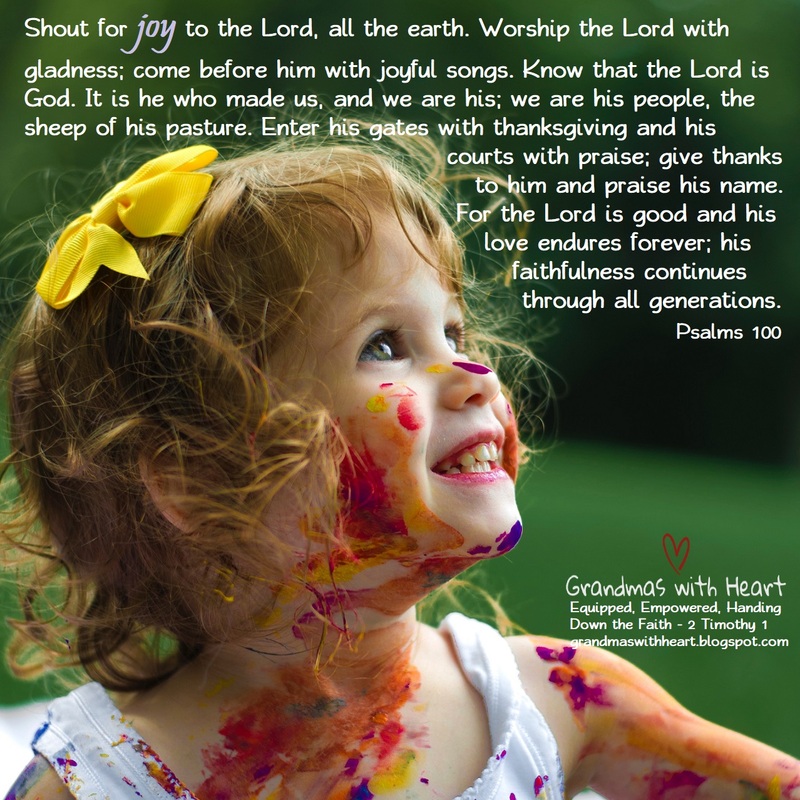 God’s Word tells us – look at Psalm 100 . . . A Psalm for giving thanks. From this passage we see . . .
Joy is a choice – make a joyful noise . . . you have to choose to do this. Serving God – and others makes us glad! God invites us to come into His presence with singing – this is all about joy! Know God is God, He made us and we belong to Him – if this does not give us joy, nothing will! Know Who God Is – He is good, steadfast, loving and faithful not just to us, but to all the generations who follow! Joy is all about serving, worship, knowing we belong to God, being thankful and knowing Who God is. This joy shows itself in what we say and do – and in our thankfulness – and comes from these things, too! I want my grandsons to know this joy, so one of the things we focus on at my house is being thankful. When they are here, before meals we each share something for which we are thankful – when my youngest grandson was three years old, he often said, “donuts” . . . whether we had any donuts in the house or not! I love hearing about the things for which my grandsons are thankful and want them to learn to look at the world around them with eyes which see the many blessings of God - such as donuts! I talk about how we have so much for which to be thankful as God has blessed us and also emphasize to them often how they belong to God; He made them to be the boys they are and I’m so glad He did! If we want our grandchildren to experience joy – which far outshines and outlasts happiness – we need to be intentional about helping them know, love and walk with God.